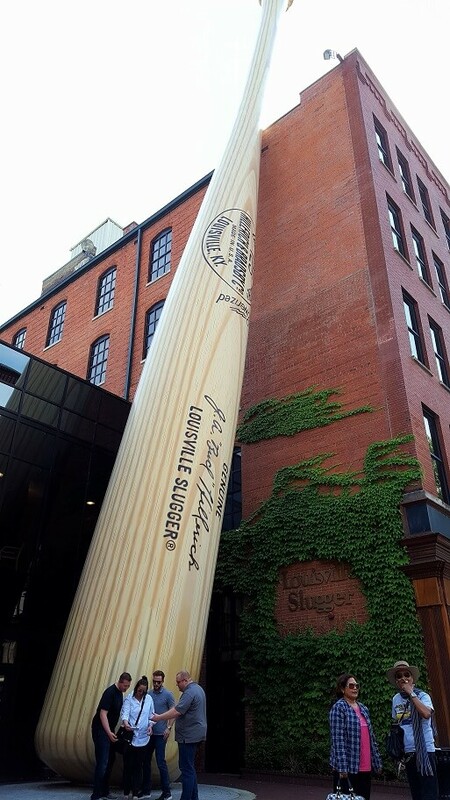 On your next trip to Louisville, Kentucky, don’t miss a visit to the place where they made “lumber for the Splendid Splinter” (lanky player Ted Williams) and still make an extraordinary array of baseball bats today – the Louisville Slugger Museum and Factory right in downtown Louisville on Museum Row. Even if you’re not a baseball fan, or even a sports fan, it is full of interesting stories and Americana. The museum has worked hard to raise its profile, and the result is record-breaking visitor numbers in recent years. Maybe stop in as you try to finish the city’s Urban Bourbon Trail? It is hard to miss the exterior, with the giant 68,000 pound, 120-foot-tall steel bat that is casually leaning up against the brick building…. 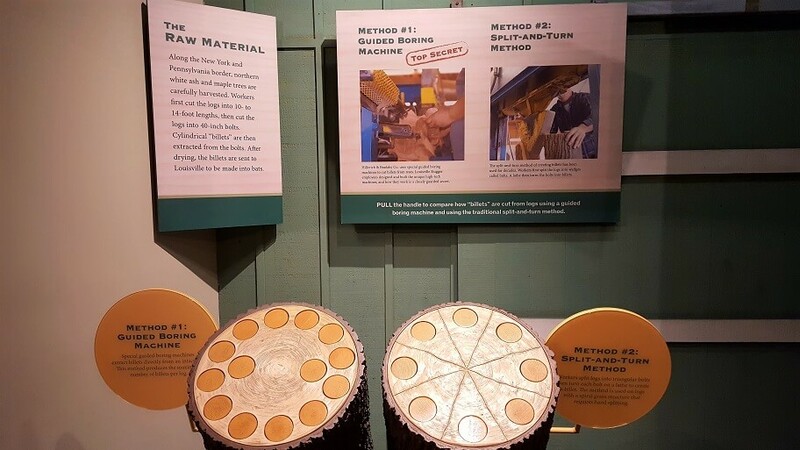 Allow about 30 minutes for the factory tour itself – it’s US$15 for adults, less for kids and seniors – and another 30-45 minutes to explore the museum exhibits. The tours start every 10-30 minutes, depending on the time of year. Cameras are not allowed on the factory tour, but you’ll see glimpses of it in the very short video at the end of this post. I was fascinated by all the details of how a tree becomes a bunch of bats. It is quite a process. The tour moves along quickly; you will see the pride that factory employees take in every meticulous step of bat-making, from raw wood to smoothing and sanding to dramatically burning on the logo and finally a dip into a giant vat of sealant. The most interesting tidbit for me was how particular each professional baseball player is with their personal bat specifications. There’s a Ted Williams anecdote describing his complaints about the handles on one of his bat orders, and measurements showed that, in fact, the bats were 5/1000th of an inch off from his preference. He could tell just by holding the bat. 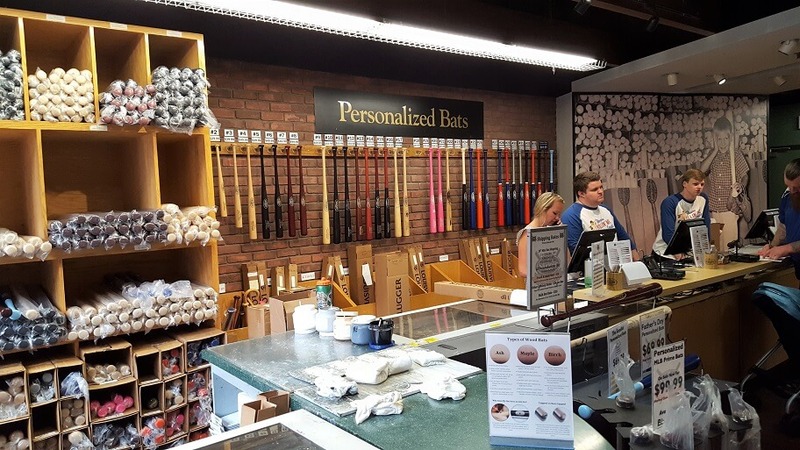 The museum follows the factory tour, and you’ll have a chance to match up two display bats yourself that are based on the story, and see if your hand can feel the difference, like Ted could. There are detailed displays that will appeal to all sorts of visitors, including fans of the movie A League of Their Own, about the women’s pro baseball league during World War II. 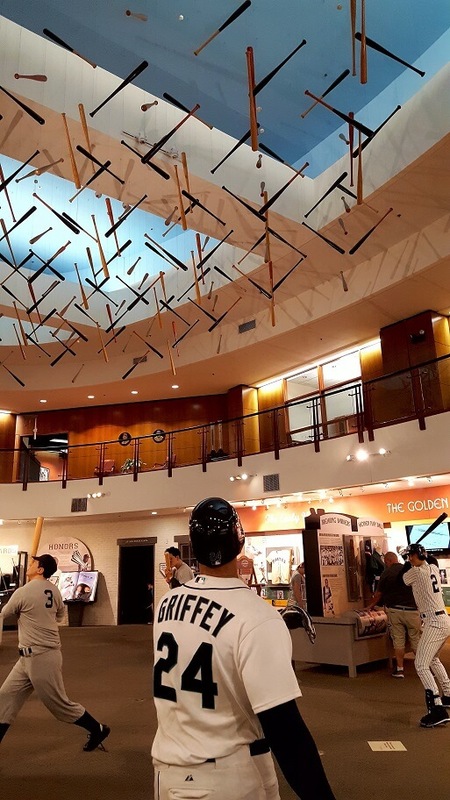 Beware the Museum gift shop – it’s full of temptations that will seem pretty irresistible after learning so much history and seeing the bats made. I spoke with one employee who was a local Louisville guy; he said he enjoyed working at the shop and meeting baseball enthusiasts who come from around the world to this shrine to Sluggers. “Yeah, growing up here, sometimes you forget to appreciate this place, and how cool it is to have this right here in our town,” he said. There are all sorts of things to do in Louisville – it will surprise you if you’ve never visited. I was struck by all of the attractive brick buildings downtown, lined up along the Ohio River. 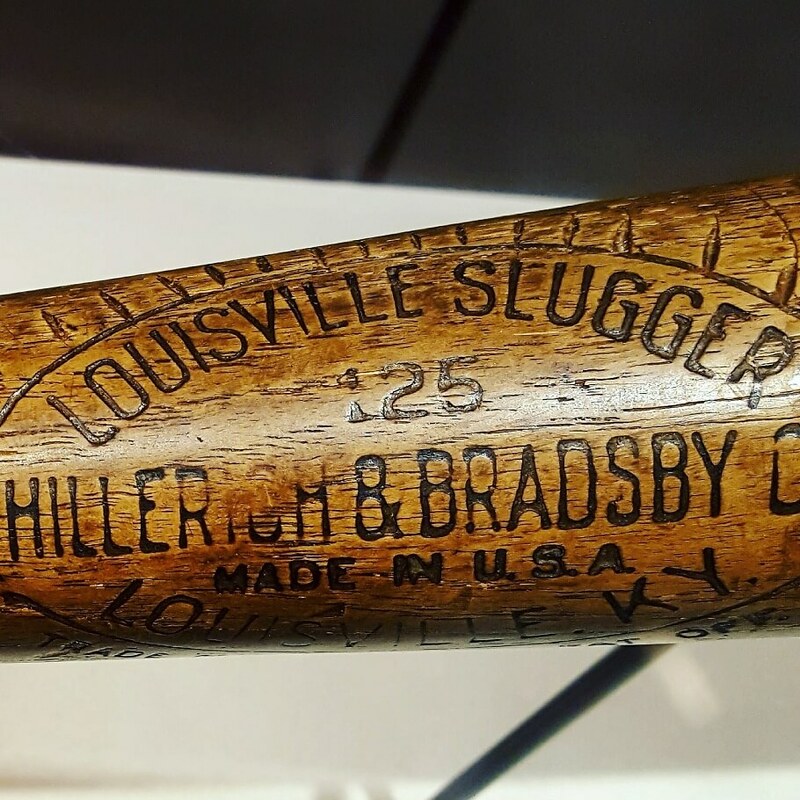 Sure, all the local bourbon options were a winner, but seeing the Louisville Slugger Museum was a highlight of my trip. This just in: Las Vegas is a surprising city. Duh.